Nike has revealed a sneaker with a bulbous heel, and a bold "retro future" design that the sports brand's team attributes to the current political climate. 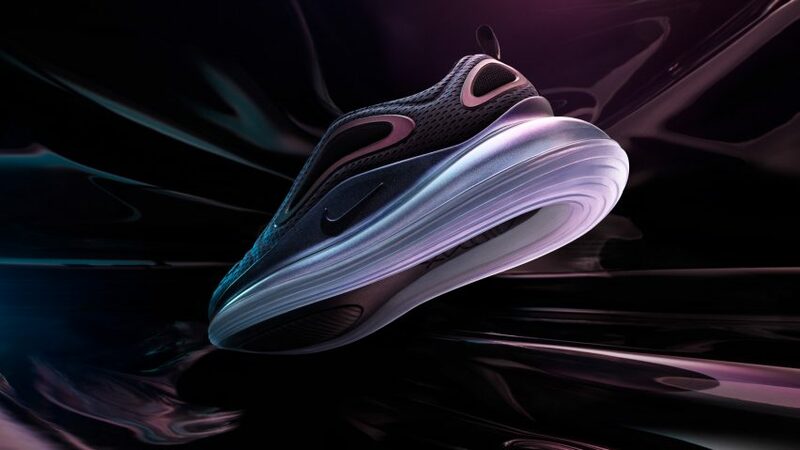 Unveiled to the public yesterday, the Air Max 720 lifestyle trainer is the latest iteration in the sports brand's Air family – famed for exposing the cushioning air pocket in the sole. The plastic airbag wraps around the heel, and can be seen 360 degrees in both horizontal and vertical directions, giving it the name "720". Lifting the shoe 38 millimetres, it surpasses the 32 millimetre height of Air Max 270, released in 1993, to become the "tallest heel unit in history". "This is the biggest diameter of tube we've ever made," Nike's vice president of cushioning, Kathy Gomez, told Dezeen. Speaking at a press preview of the product in July 2018, Gomez said the challenge of the project was innovating a large plastic airbag loop that wouldn't fracture under pressure. Her team undertook a number of trials and failures before perfecting the final design. "A lot of time was spent just engineering that air sole to get it perfectly right, so that the foot sits in it appropriately, and it functions," she said. "And then making, iterating, so it works, and then figuring out how to manufacture it." The plastic ring is also made up of more than 75 per cent recycled manufacturing waste, following Nike's new focus into sustainability, which its chief operating officer Eric Sprunk outlined in an interview with Dezeen earlier this year. The Portland-headquartered brand has only released one image of the design so far. It shows that the airbag will be detailed with concentric marks, with boomerang- and bean-shaped pockets puncturing the fabric upper to follow these circular forms. Revealed in dark purple, more colour options will be rolled out later. Each will draw on tones found in the natural environment, like lava flows, the Northern Lights, the Milky Way, and sunsets and sunrises. Among these are bold sandy tones and brash teal-blues, all of which are arranged in swirling gradients to offer a retro-vibe. "We were talking a lot about sci-fi and the idea of retro future," Courtney Dailey, vice president of colour design, told Dezeen at shoe's press reveal. "If you imagined 2001 Space Odyssey was made in the 1970s, but it was an imagination of what 2001 would be," Courtney Dailey, vice president of colour design, told Dezeen at shoe's press reveal," she added. "We were looking back at that Y2K era and imagining what in 2000 we thought was going to be 20 years in the future." The bold shoe design follows "a more minimal period" at Nike, including products like the popular Roshe. This aesthetic shift can be attributed to recent changes in the cultural and political climate, according to Dailey. "You can pretty much chart that the rise of minimalism comes with prosperity, and then when you get to a more darker time – a time of unrest or discord – you start to see people being more expressive, and their fashion tends to go there too," she said. "Our job is to see what's coming and imagine how those trends might swing." Dylan Raasch, the senior creative director of Nike Air Max, echoed this in conversation with a group of journalists at the press event. He said that unrest was especially prevalent among today's younger generation – the brand's target audience. This is particularly true in the Nike's home country, where this age group has launched campaigns for gun control and gender equality in response to Donald Trump's presidency. "Things get a little more aspirational and brighter, when things get harder," said Raasch. "If you think about the 1960s and 1970s, the flower children they were all wearing crazy stuff at the time." "You're starting to see that happen again and you make a correlation with what's going on with politics... it's pretty messed up right now," he added. Nike's Air Max product line was established in 1987, when the brand's legendary shoe designer Tinker Hatfield came up with the idea to expose air pockets in the sole of the Air Max 1 running shoe. The innovative line has since developed with designs that include two air cushions, and then the full-length air bag, which was first released in 1997. Hatfield has marked the Air Max 720 as a progressive step in the series, according to Raasch, who admitted that the designer had been "underwhelmed" in the developments of recent years. "He was telling us that we were going into new space with the stuff, and scaring some people at the same time," he said. "This was something that rekindled his faith in the hope that there was some newness that was happening, that wasn't so predictable."